With a prime location in the business and shopping district of San Isidro The Westin Lima Hotel & Convention Center offers services that fill the needs of corporate travelers and tourism. Numerous restaurants, embassies, art galleries, corporate offices, and shopping centers are very close to the hotel, both in San Isidro and Miraflores and Barranco. 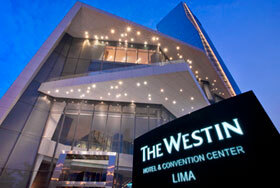 Just 15km from Lima International Airport, The Westin Lima Hotel & Convention Center can arrange transfers in advance with an executive shuttle. Heavenly Bed ®: luxury linens, goose down blankets, five soft pillows and mattress super comfortable ... a divine combination. Heavenly Bath ®: Redefine the guest experience through a unique shower head vertical, soft towels (100% cotton) and a range of exclusive amenities. Deluxe Room: These 102 rooms of 43m2 each, are equipped with our traditional Heavenly Bed ®. For people who need to work, the room features a large desk, Jack Pack and complimentary high speed wireless internet (fee). The room is equipped with a walk-in closet, LCD TV 37 ", minibar, safe and two queen beds or one king. The Heavenly Bath ® is very spacious, the shower is separate from the tub and the most comfy robes and slippers are available. 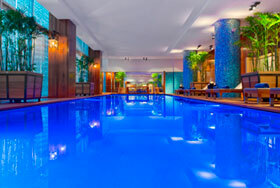 Additionally, we have two rooms with a mini gym inside the room and 7 rooms for disabled. Grand Deluxe Room: You may choose to book a Grand Deluxe room with two queen beds or one king bed in a comfortable space of 43m2. 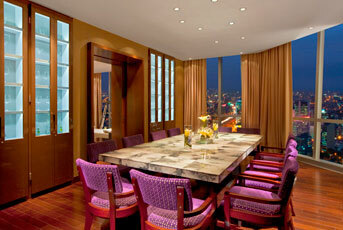 All Grand Deluxe rooms are located on floors 12, so they have a privileged view of the financial district of Lima. Some features of the room are: LCD TV 37 "walk-in closet, high speed wireless internet (fee), minibar, safe, a Jack Pack for different electronics and a spacious desk and also our Heavenly Bed ® and Bath ® Heveanly. The style of the room is elegant and contemporary and has Peruvian items in your decor. We have 132 rooms Grand Deluxe. 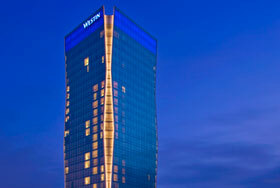 Westin Executive Room: A real privilege for those seeking rest and endless room fully equipped to continue working. It features a king or two queen beds, an LCD TV 37 ", high speed wireless internet (fee), walk-in closet, minibar, safe, a Jack Pack for those travelers who carry multiple electronic devices and as also our Heavenly Bed ® and Bath ® Heveanly. 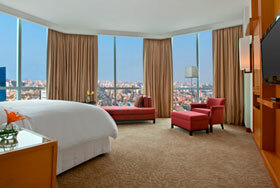 These 34 rooms are located on floors 27 to 30, thus offering an exceptional view of the bay. Guests have free access to the Westin Executive Club where they can enjoy a continental breakfast, snacks, coffee and tea during the day, ironed suit and Wi Fi at no extra cost as well as happy hour wine and beer. Executive Suites: The suite has a separate sitting room, LCD TV 42 ", guest bathroom and a small dining room that can also be used as a work table. Our 12 Executive Suites have 65m2 and are equipped with our famous Heavenly Bed ® and Heavenly Bath ®. also have a walk-in closet, LCD TV 37 ", minibar, safe, wireless high speed internet (fee). For those guests who prefer to work out Room, guests of this suite have free access to the Westin Executive Club benefits, which includes a continental breakfast, snacks, coffee and tea during the day, ironed suit and Wi Fi at no extra cost as well as happy hour in wine and beer. Master Suite: Located on the 18th floor, our Master Suites feature a separate living room, LCD TV 42 ", a bar and a small dining room that can also be used for meetings. Our 7 Master Suites have 85m2 and are equipped with a walk-in closet, Heavenly Bed ®, Heavenly Bath ®, LCD TV 37 ", minibar, wireless high speed internet (fee), and a Jack Pack safe. These guests have access to the Westin Executive Club where they can enjoy a continental breakfast, snacks, coffee and tea during the day, ironed suit and Wi Fi at no extra cost as well as happy hour wine and beer. Renewal Suite: A suite designed for guests seeking a totally relaxing experience. We have 2 Renewal Suite of 86 m2 c / u and have a separate sitting room with a TV LCD 42 "and a small dining room that can also be used for meetings. It has walk-in closet, Heavenly Bed ®, Heavenly Bath ®, wireless high speed internet (fee), TV LCD 37 ", a Jack Pack and a safe. These guests have access to the Westin Executive Club, where you can enjoy a continental breakfast, snacks, coffee and tea during the day, ironed suit and Wi Fi at no extra cost as well as happy hour wine and beer.This suite features special spa amenities like aromatherapy products, magazines, details of Feng Sui, special amenities, 15 minute shiatsu massage, upgraded lights, MP3 with special music, special welcome amenity, a small waterfall in the room and the bathroom and many more special services. Grand Suite: Located on floors 19 and 26 of the hotel, our Grand Suite is designed for guests who want to hold working meetings in the room. Our Grand Suite has a separate sitting room with a TV LCD 42 ", a media player and a small meeting room for 6 people. The room is equipped with a walk-in closet, Heavenly Bed ®, Heavenly Bath ®, wireless high speed internet (fee), TV LCD 37 ", a Jack Pack and a safe. These guests have access to the Westin Executive Club where they can enjoy a continental breakfast, snacks, coffee and tea during the day, ironed suit and Wi Fi at no extra cost as well as happy hour wine and beer. The hotel has 7 Grand Suite of 92 m2 c / u. Ambassador Suite: Located on floors 27 and 28, our two Suites Ambassador is a spacious room with 132m2, where customers can enjoy the convenience you need. It has a separate sitting room with a LCD TV 42 ", spacious dining room, a pantry and bar. The master bedroom is equipped with a walk-in closet, Heavenly Bed ®, Heavenly Bath ®, wireless high speed internet (fee), TV LCD 37 ", a Jack Pack and a safe. This suite has a second room with two queen beds. These guests have access to the Westin Executive Club, where you can enjoy a continental breakfast, snacks, coffee and tea during the day at no extra cost as well as happy hour wine and beer. Presidential Suite: Located on the top floor of the tallest building in Peru and with exceptional city views, this luxurious Presidential Suite has 270 m2 and includes all services that require discerning guests during their stay. It has an entire room equipped with LCD TV 42 ", guest bathroom and a multimedia team meetings. The large dining room, fully equipped kitchen and a cellar make this area an ideal place for visitors. Additionally, we have designed a dispatch office and a mini gym ideal for our guests to feel at home. It also offers our comfortable Heavenly Bed ® and Heavenly Bath ® with separate shower and jacuzzi, a room attached and free access to the Westin Executive Club. Market 770: Restaurant open from breakfast to dinner, presents an innovative and existing market cuisine is based on both high quality products every day as well as the products of each season. Diners can opt for homemade or more sophisticated dishes that remain true to the essence of the ingredients used in its preparation. Market 770 offers an interesting lay out tables in various sizes, depending on the number of guests and a buffet area with central islands, decorated with murals. At the entrance are two wine cellars and wine by the glass dispenser. It has an attractive private room on the second floor where you can provide breakfasts, meetings, lunches or dinners. We also have options Super Foods Rx ™ for diners who prefer healthier options. Hours: Monday to Sunday from 6:30 hrs. to 10:30 hrs. / 12:30 hrs. to 16:00 hrs. / 19:00 hrs to 23:00 hrs. Maras Restaurant: Maras is a meeting place that offers a modern Peruvian cuisine, which rescues their bold flavors and create new sensations on the palate of its guests. 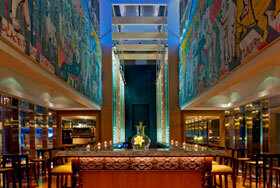 The address of Maras is by renowned chef Rafael Piqueras, one of the top five chefs in Peru. Maras offers an unforgettable dining experience through a journey of the senses, by the coast, highlands and jungle of Peru. The total capacity of the restaurant is 83 diners in an area of ​​110.25 m2, the restaurant has a private room for 10 people overlooking the kitchen, which allows direct contact with the kitchen amenities. Hours: Monday to Friday from 12:00 hrs. to 16:00 hrs. / 19:00 hrs. to 00:00 hrs. and Saturday from 19:00 hrs.to 00:00 hrs. Lobby Lounge: The main hotel bar with extended hours, offers everything from coffee, tea, herbal teas and the most innovative cocktails pisco-based preparations. Also has a varied menu of drinks, cocktails and snacks for everyone. Our Lobby Bar delights us with a showcase with over 1500 bottles of Pisco which welcomes the public who wishes to have a moment of relaxation and fun. Hours: Monday to Sunday from 10:00 hrs. 1:00 hrs. Hours: Monday to Sunday from 17:00 hrs to 2:00 hrs. The Westin Executive Club: It is a special and unique for our guests which offers a special and personalized care for them. 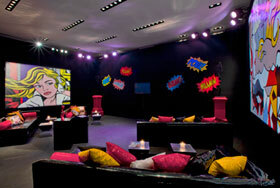 It has spaces where guests can hold meetings and work sessions. In our Executive Club can enjoy a continental breakfast, snacks, coffee and tea during the day as well as happy hour wine and beer. Access to the Executive Club additional cost. Hours: Monday to Thursday 24 hours. Friday, Saturday, Sunday and holidays from 07:00 hrs. to 23:00 hrs.